Steve Martin is one of the world’s most beloved personalities. He is a popular actor, comedian, writer, producer, author, and musician of American origin. He started out as a stand up comic before branching into movies with tremendous success. Some of his most notable movies are The Jerk (1979), The Man with Two Brains (1983), Three Amigos (1986), Father of the Bride (1991), Cheaper by the Dozen (2003), and The Pink Panther (2006). In a successful career spanning over 5 decades, Martin has won several awards and was named 6th on Comedy Central’s 2004 list of 100 greatest stand-up comics. Want to know more about this quintessential comedian? Then you are in the right place. Stephen Glenn Martin was born on the 14th of August 1945 in Waco Texas. He was born into a Baptist family of five which included father, Glenn Vernon Martin, and mother, Mary Lee. He also had two siblings, a brother Fred and a sister Melinda. The young Martin grew up in the state of California, specifically Inglewood and Garden Grove City, where he had his elementary and high school education. Steve Martin’s journey into the world of comedy and acting commenced at quite a young age. When he was just 10 years old, he got a job at Disneyland selling guidebooks to visitors. From that job, he graduated to the magic shop at Disney’s Fantasyland theme park where he learned the art of magic, juggling and creating balloon animals. On graduating from high school, Martin utilized his free time, joining a theatre troupe as well as taking part in theatrical productions. For his college education, Steve Martin attended various schools including a community college located in Santa Ana, California State University, Long Beach and University of California, Los Angeles (UCLA). His college education came to an end entirely when he dropped out at the age of 21. After dropping out of college, Steve Martin landed his first gig in the industry as a writer for the CBS show, The Smothers Brothers Comedy Hour. From there, he was hired to write for other CBS comic shows such as the Glen Campbell Goodtime Hour and The Sonny and Cher Comedy Hour. He and other writers won an Emmy for their writing on Smothers in 1969. From writing, Martin eventually progressed to appearing as a stand-up comedian on various shows such as The Tonight Show starring Johnny Carson and Saturday Night Live etc. He appeared on SNL on 27 different occasions and guest hosted 17 times. Following his successful appearance on these shows, Martin released two successful comedy albums, Let’s Get Small (1977) and A Wild and Crazy Guy (1978). Both albums went platinum and won the Grammy award for best comedy recording in 1977 and 1978 respectively. In the 1980s, Steve Martin got the opportunity to take part in movies and he grabbed it with both hands. His first major appearance was in the 1977 film The Absent-Minded Waiter. He co-wrote and starred in the 7-minute long film which was nominated for the Academy Award for best short film. Martin’s next notable work was the 1979 comedy, The Jerk, which he also co-wrote. The movie proved to be a critical and commercial success, garnering over $100 million on a budget that was less than $5 million. Since then, Steve has gone on to acquire an enviable movie credit. Some of them include Roxanne (1987), Planes, Trains and Automobiles (1987), HouseSitter (1992), The Spanish Prisoner (1997), Bowfinger (1999), Bringing Down the House (2003), The Big Year (2011), Home (2015), Love the Coopers (2015). In addition, Steve Martin is a consummate banjo player and bluegrass musician. He released his first full-length album, The Crow: New Strings for the 5-String Banjo, in 2009. The album featured heavyweights such as Dolly Parton and won Martin the 2010 Grammy Award for best bluegrass album. 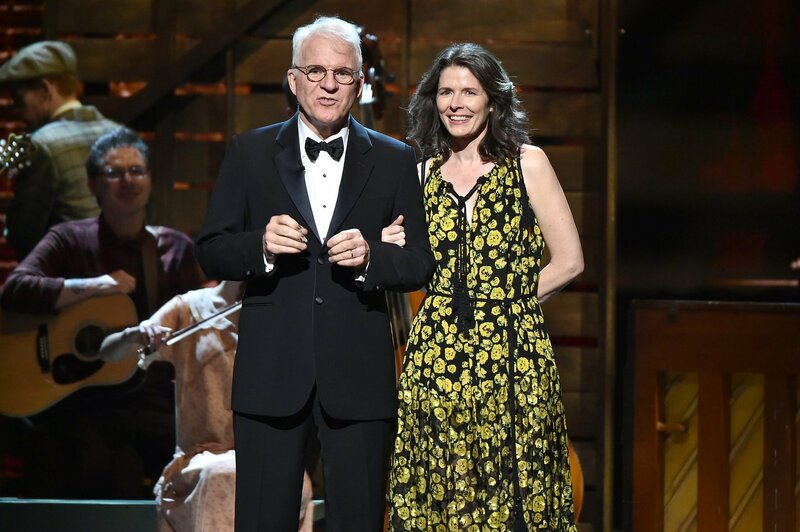 Steve Martin has a total of three bluegrass albums including Rare Bird Alert (2011) and So Familiar (2015). He did the last two in collaboration with other artists. He is also an accomplished playwright and has several plays, novels, and novellas to his name. 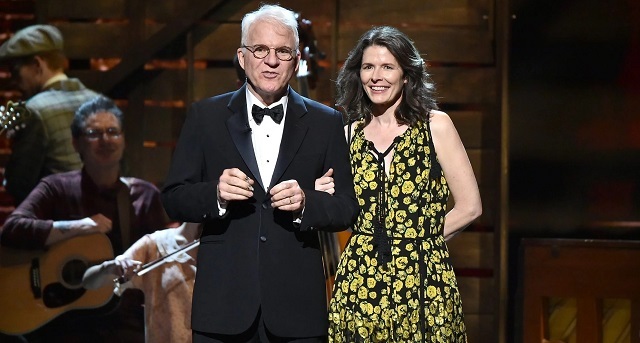 Steve Martin got married for the first time in November 1986. He tied the knot with actress Victoria Tennant. She was his co-star in the 1984 movie All of Me as well as the 1991 movie L.A. Stories. They divorced in 1994 after 8 years of marriage. Martin is currently married to Anne Springfield. She is a writer and former editor of The New Yorker magazine. They dated for three years before heading to the altar on the 28th of July 2007 in a surprise ceremony at Martin’s LA home. The ceremony had 75 guests in attendance, including the likes of Tom Hanks, Diane Keaton, Eugene Levy, Carl Reiner, and magician Ricky Jay, and was presided over by former Nebraska senator Bob Kerrey. The couple welcomed a daughter in December 2012. Martin became a dad for the first time at the age of 67, a time when most people are thinking about retirement or becoming grandparents. However, it was all joy for him. According to him, he is grateful that he had his child later in life as it means that he will have time for his daughter and not abandon her for his career. As for his daughter’s name, it is one of the world’s best-kept secret as the actor and his wife has refused to give it up. Steve Martin is worth a whopping $110 million, which is not surprising given the longevity of his career. His sources of income include the numerous tours he has embarked on as a stand up comic, his many movies, TV shows appearances and album sales. He must have also made a cool mint from all those appearances on SNL.